Patients who require highly complex abdominal wall hernia repair with composite soft tissue free flap coverage represent the most challenging population, and the most difficult to definitively treat. For many, this combined procedure represents their last chance to restore any sense of normalcy to their lives. To date, patient reported post-operative outcomes have been limited in the literature, in particular, quality of life has been an under-reported component of successful management. 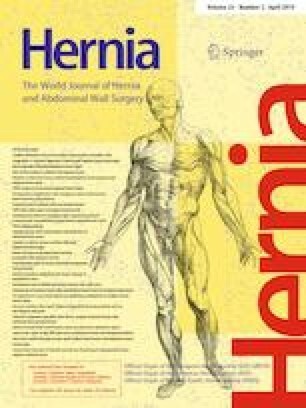 Patient-reported outcomes were analyzed using the 12-question HerQLes survey, a validated hernia-related quality of life survey to assess patient function after complex abdominal wall reconstruction. Using synthetic mesh for structural stability, and microsurgical flaps for soft tissue coverage, ten consecutive heterogeneous patients underwent repair of massive abdominal wall defects. Baseline preoperative HerQLes and numerical pain scores were then compared to those obtained postoperatively (at or greater than 6 months). All patients experienced improvement in their quality of life and pain scores post operatively with average follow-up at 15.9 months, even in those who experienced complications. All microsurgical flaps survived. There were no hernia recurrences. Despite the extraordinary preoperative morbidity of massive abdominal wall defects, with an experienced General Surgery and Plastic Surgery multidisciplinary team, these highly complex patients are able to achieve a significant improvement in their pain and quality of life following repair and reconstruction with complex mesh hernia repair and microsurgical free tissue transfer. We would like to thank Pat Shoda and Susan Lopez for their photography expertise and assistance preparing this manuscript. Michael Rosen MD receives research support from Intuitive and Miromatrix, and salary support from the Americas Hernia Society Quality Collaborative (AHSQC). David Krpata MD is a consultant for Medtronic. All other listed authors have no financial disclosures. No funding was received for this article. REA declares no conflict of interest. JG declares no conflict of interest. DK declares no conflict of interest. SR declares no conflict of interest. MR declares no conflict of interest. RG declares no conflict of interest. The article does not contain any identifiable information and the content is compliant with HIPPA regulations and human rights.